is back at Kenwood Yard. I sighted her this morning. Based on the rattiness of the paint job I don't know how much longer she'll be in lighting stripes so if you're going to be in the area, bring your camera. Bob Sandusky wrote: is back at Kenwood Yard. I sighted her this morning. Based on the rattiness of the paint job I don't know how much longer she'll be in lighting stripes so if you're going to be in the area, bring your camera. Why would CP repaint one of their heritage units? Otto Vondrak wrote: Why would CP repaint one of their heritage units? You have to ask them that not me but they seem to do it all the time. Other than 7303 and 7304 does anybody know of any other former D&H units still in stripes? If I was to hazard a guess it would be because of the cost of repainting the unit in the stripes scheme. Like I said it is looking a little ragged. If you go past Kenwood consistently you'll see several 7300 units (I think the last one I saw was 7310) repainted in a red scheme, with I think the StL&H lettering. CP has three "D&H Heritage units".. 7303, 7304 and 7312. 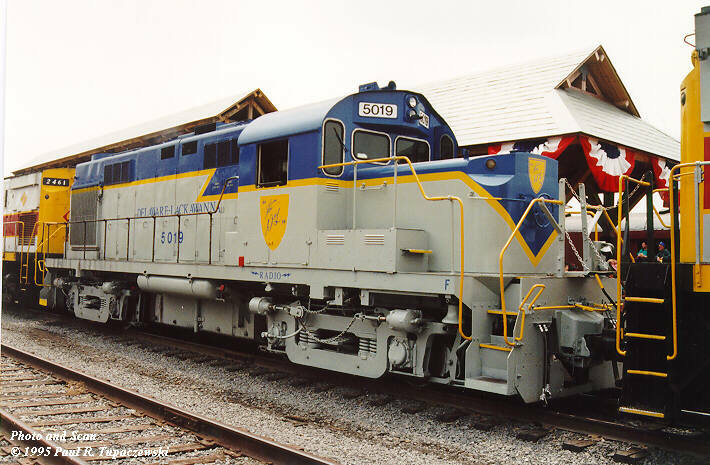 All three are originally Lehigh Valley GP38-2's..
there are three other D&H units (Alcos) still in D&H lightning stripes, but the three CP units are the only ones in Class-1 service. (her fate is uncertain! she needs a new home! UHRR is no longer running..
D&H 4112/1976/506, Tioga Central Railroad, Wellsboro, PA. I believe that is all of them..6 units total still in D&H lightning stripes..anyone know of any more? Went past Kenwood again today and 7305 is there in CP colors and lettering. Didn't know about 7312 still being in heritage colors, thanks Scott. I was under the impression that the unit up in North Creek is not an ex-D&H unit but an RS-11 painted up to look like a D&H unit. Don't ask me where I heard that it was some years ago. Bob Sandusky wrote: I was under the impression that the unit up in North Creek is not an ex-D&H unit but an RS-11 painted up to look like a D&H unit. Don't ask me where I heard that it was some years ago. She has been repainted, which might have led to some confusion, but she is definately D&H 5019. She is privately owned, and went to the UHRRR in 1998, when the UHRRR began. The 5019 had the same owner when on the DL as now, Southwind Railtours, owner of the Southwind (a smoothside car whose owner hoped to provide excursion service on the Pocono Northeast many years ago). Anyone know if 7303 will be in Kenwood on Sunday? I will try and get some pictures then if she will be there. Either 7303 or one of its sisters in DH was in Conklin yard yeatserday. Does anyone know which loco it was? Heard a rumor that the 7303 and '04 have supposedly been painted CP red, leaving the 7312 as the last striper. Anyone confirm/dispel?? bk77 wrote: Heard a rumor that the 7303 and '04 have supposedly been painted CP red, leaving the 7312 as the last striper. Anyone confirm/dispel?? rail fan ,I was super excited to see the all lightning stripe consist! I usually just lurk here . I love the reports and especially the pictures !! Take care all and stay warm ! considering that was 2 days ago, I would say "dispel"
OK, GOOD! Thanks for the update!